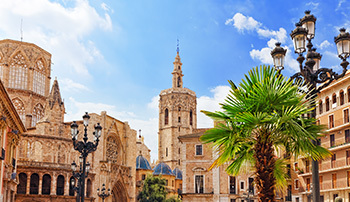 Valencia, situated on the Mediterranean coast, is the third largest city in Spain and is growing rapidly. The city is a mixture of old and new, home to the biggest aquarium in Europe within the City of Arts & Sciences. A fascinating example of Spanish modern architecture in comparison to the imposing Gothic Silk Exchange. Traditions in Valencia run deep, if you are here in March don't miss 'Las Fallas', an amazing and noisy festival with plenty of fireworks, flames and bangers! Valencia is warm pretty much all year round, ideal to enjoy the fantastic beaches, promenades and parks. If you want city, sea and sand then this is the destination for you to learn Spanish! The Spanish language school in Valencia is like the city itself, large, with 600 student capacity. Some students are Spaniards learning other European languages so it's a great opportunity to practice Spanish and make friends outside of class. The school building is directly opposite the University of Valencia so there's a fab student vibe and night-life! 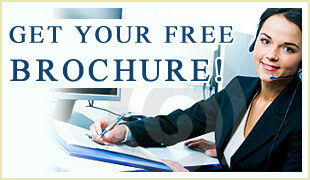 Choose from more than 10 different courses, study time-tables and Spanish city combinations. Catch the bus or tube from right outside the Spanish school in Valencia and in just 20 minutes you're be in the city center or on one of the golden beaches!